My Classes are Only 45 Minutes — How Do I Do Workshop? English I teacher asked: I have a question for you about classroom routine. I felt I needed to ask someone who can answer with authority about this because there is significant resistance from teachers on my campus to the whole idea of workshop, especially from my department chair. For various reasons that I won’t bore you with, we need to do a “by the book” implementation. We will be under a lot of negative scrutiny no matter what we do, but things will go better if we are following some sort of precedent on certain details. I’ve found specific information about block schedule and the frequency of in-class silent sustained reading, but I haven’t found anything for non-block schedules. We are non-block with 45 minute periods. I think I read on your blog that you used to use Workshop in a non-block schedule. When you did that, how often did you do the in-class reading? If I have 50 minutes with my students each day. Every minute matters, so I must be intentional in the choices I make. I used to choose whole class novels and read at least part of the novels in class. I used to assign students guided questions to help their understanding of those novels. I used to give lists of vocabulary words and ask students to define, write sentences, create images. I used to give writing prompts and writing homework. I used to expect students to read and write outside of class without ever showing them the messiness, the thinking, the discovering of ideas and emotions and writer’s moves on the page. I used to make all the choices, and I expected my students to go along for the ride. Some did. Many did not. It finally started to dig at me that many was so much greater than some. I choose not to do any of those things now. 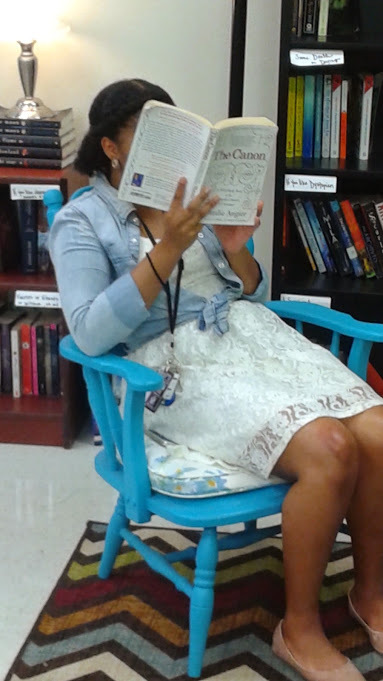 Now, my students and I choose to read books we find interesting, engaging, and important to our lives. We read, discuss, and write about how the ideas inside these books are windows to the world outside our own, and how they are mirrors into the joys, aches, and heartbreaks we see inside ourselves and within our families. I wrote about 7 Moves in My Workshop Schedule a while ago. These moves are non-negotiable: read, confer, talk, write, revise, share, mini-lesson. To make these workshop moves work, we must also include these tools as non-negiotables: writer’s notebooks, mentor texts, high interest books. You specifically asked about the frequency of in-class independent reading in a class period of 45 minutes. Read every day. Every day. Every day. She asked for a book that would help her learn science and accomplish her reading goals. Students will challenge themselves. Really, they will. Read at the beginning of every class period — 10 minutes. You do not need a bell ringer or any other focusing task when students know that the expectation is to come in the room and get to reading. The first chapter in Steve Gardiner’s book Sustained Silent Reading offers some great information — and quotes Nancie Atwell on the importance of choice. Encourage and challenge students to read outside of school. Help them create goals, and them help them hold themselves accountable to reaching them. Confer when students are reading. Make this a norm. Conferring moves readers workshop instruction forward. And students want and need us talking to them about their reading, about their thinking, and about their lives. One-on-one instruction happens here, and it is through this teacher move that belonging, identifying, coaching, challenging, and empowering happens. When you create a classroom culture of reading, discipline begins to care for itself. It’s a matter of setting expectations and then being consistent with them. If I have a student who refuses to read, which happens at times, especially early in the year, I make sure she knows that she has that right, but she does not have the right to interfere with anyone else’s right to read. Sustained Silent Silence instead of Sustained Silent Reading gets boring after a while. Write about their reading. Now, I’m not advocating for dialectic journals or questions about plot and setting, but it is important that students become reflective about their reading. Find a balance here. We do not want reading to turn to work, and demanding that students write about their reading way too much may turn them off to reading. Think about the books you and I read. How often do we have to write an essay about a novel we read? 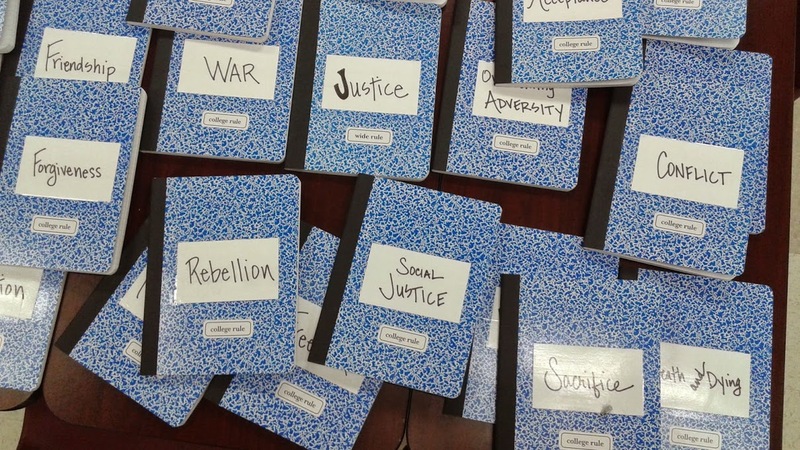 The topic notebooks in my classroom. We write in them about every three weeks. This is a fun way to share our thinking about our books. Teach skills in mini-lessons. I decide on mini-lessons based on two things: 1) my standards, 2) student needs based on what I learn in conferences. Say I need to teach them about using the appeals in an argument, I may teach a mini lesson on logical appeal one day. Then I will ask students to do some flash research and find evidence of this appeal in either their independent reading, a news article, or an online text. We’ll share our findings and do a lot of talking — Why’d the writer use that appeal? How does it contribute to the argument? etc. Then, students will know I need to see them use that appeal in their own writing. We write (and confer) for the rest of the class period. Or, we share our writing in our writers’ groups. We’ll talk about why one book may be more complex than others. I might challenge students to read all of these titles and then tell me if I have the ladder right. (I may not, I haven’t read every one of these books, but I think I’m on the right track.) I’ll teach students about syntax and how that impacts text complexity as much, or more, than vocabulary. Then, I’ll challenge students to keep track of the complexity of the books they choose, not only by keeping their personal dictionaries up to date, but by adding codes to their reading lists. E – easy, C – comfortable, D – difficult. I show them my writer’s notebook and how this tracking helps me understand my reading habits. Allow time to work. The greatest indicator that workshop works in my classroom is student engagement. When I allow students time to complete writing in class with me available to talk to and ask questions, they engage in the writing process more efficiently and effectively. I’ve let go of wanting a product, and now we enjoy the process of writing. We discover as we write. We revise because we know our writing improves as we revisit it. We share our writing because all voices in our classroom matter. The only way to accomplish these things is to build time to write right into the class schedule. But that’s probably another post for another day. Best blessings to you as you take off on this wonderful adventure with your students. Write any time: for support, for clarity, for whatever you might need. You’re blessing the lives of children. Our future –our society — needs educators like you. Press forward (nay-saying department manager and all). Dear reader, any advice you can offer our friend? Thank you so much for confirming and encouraging what I have recently been researching and trying to slowly implement. I have a rather specific question that may be dumb, but… Would/Does your schedule remain the same when teaching dramas? We are required to teach “Julius Caesar” and I’m interested to know how teaching plays (already a complex task for me) fits into the workshop model. Please help… thanks! Hi, Britt. I am fortunate I do not have any texts I am required to teach; but, in short, yes, the same routine will work for any whole class text. The key is to establish routines of reading, writing, thinking, and talking in every class period. Do you have to read the whole play together, or can you chunk it: some video, some summary, some actual text? I ask because I always plan lessons based on the end goal: What do I want students to be able to do with the skills and knowledge from the text? If I am working on teaching persuasive techniques, I may summarize a lot of the plot, so I can get to a close read of the speeches in Julius Caesar. Workshop time is any time students are deeply engaged in the work. I wrote a post about that last summer: “[workshop is’ students doing the work of readers and writers, “engaged in intensive discussion and activity on a particular subject” — specifically related to growing as readers and writers.” (Here’s the link to that post https://threeteacherstalk.com/2017/06/20/defining-readers-writers-workshop/) To me this doesn’t mean dragging students through the whole text with a focus on comprehension, which in my experience is what often happens with drama. It does mean getting to the parts where students can dig in and get into the deep thinking that helps them experience the meaning on a level they can work with. I hope this helps. Thanks for reading. Best wishes! Andy, thank you for your comment and sharing where you are struggling. You’ve made me think here, and I responded in this post: https://threeteacherstalk.com/2017/01/09/on-in-defense-of-read-alouds-please-do/ Thanks for the writing inspiration. Your students are blessed to have you! I’ve been feeling really at odds the past few weeks. I’m in the same school but switching from teaching primarily 8th grade ELA in which I was free to workshop away to 11/12 semester-long English electives (there are no core 11/12 English class, just semester electives–don’t get me started) and US History 11. My English classes don’t have predetermined texts but do have themes: in the fall I’m teaching “Banned Books,” and in the spring I’m teaching “Short Stories.” Needless to say I’m feeling myself pulled back into the whole- text orbit. This post has helped remind me to pull back, that it’s not about content, it’s about skills, and that English class is not only about formal written papers. So thanks. I feel like this year is going to be a real challenge for me in that I going to be working on squishing the predetermined theme for my course into the workshop mold. Along those lines, what are your expectations about how often high school students turn in polished work? Any thoughts about how to deal with the topic of students’ polished work given that my course does have a theme? In the past, we’ve focused more on different modes of writing, as per most recommendations for workshop. Also, Kelly, I’m very interested in learning more about Barnes method of response. Thanks for bringing it up. Inspirational as always. Thank you! Kara, sounds like you are in for an interesting adventure. I would have loved to have taken a Banned Books or Short Stories course! I also know you can make workshop work. It’s only been in the last few years I’ve been cognizant of using themes to tie my skills-based units together. I like using themes for lots of reasons (besides that research says it’s a good idea), but I also like the idea of letting students connect ideas and build the theme together. You could do something like that in either of these classes: select texts that relate somehow, and then as students select texts ask them to read with a lens to make similar connections. Your other questions about “topic of students’ polished work”: Is there a way for you to prompt them to think about ideas from your reading? This way students still have choice, but you are planting seeds of some of the choices kids might select. For example, I’m going to challenge my students to read a book that deals with social justice — many topics will be addressed in these books. They will choose a topic from their books to expand into an argument…defend, challenge, qualify…something like that. I can see this working in either of your semester courses. Amy, Hope you had a great summer. Love this post and the links embedded. Will definitely use these posts with my graduate students this semester. I love that you are teaching your grad students what I wish I learned in my program. They will be so far ahead, and their students will be so far ahead. Thank you! I have roughly 50 minutes with students also, to teach both writing and social studies. Like Amy, we have a dedicated practice each day when class begins — but students aren’t reading right when we start, they are writing. They know to come in and start writing — anything they want, though I often have a picture or video or poem up for them to view as inspiration. I also chose to drop several activities from my normal routine, and now we write, share, read mentor texts, discuss, and write and share some more. 🙂 It’s not unusual to get odd looks or comments that “surely you can’t teach it all” the way my classroom is managed. The great thing is, much of the learning happens organically through what we read and write. I’m just there to make sure we stay on track, that learning keeps moving forward, and our standards (and then some) are covered. Kelly, I’ve missed you! Thanks for sharing your wisdom and routine here. I love this line: “I’m just there to make sure we stay on track, that learning keeps moving forward, and our standards (and then some) are covered.” You are the best kind of teacher! Great post, Amy! We, too, teach workshop in a 45- minute period. I can testify — it CAN work. On the note of doing this and not doing that, I will second that I used to do a lot of “activities” in my class. Now, writing IS the activity. That’s what we are doing. Far less poster-making. Far more meaning-making. Oh, the “activities” — I used to dream up the best of them! Simply a waste of time. Time that could have been spent on writing, or reading, talking about writing and reading. Thanks for this comment Rebekah. I’m really intrigued by workshop-driven classrooms and I’m anxious to test drive it in my own. But I’m curious about grading. If I had my way, I wouldn’t assign number grades and instead I would write an individualized note for each student. But, alas, I am forced to give number grades. What and how do you grade? This year I’m using Mark Barnes’ SE2R feedback model and not giving any letter grades in class. I assess daily as they write, noting where students are with a mastery level scale (Marzano) I taught my students. They know they will receive verbal and written feedback and when we conference we will look at where they are on the mastery scale with each standard we’re working on. I have a translation from the mastery scale to letter grades to use in my required online gradebook and report cards, which I’ll reference as we conference. There is a way to move away from grades in a workshop model! 🙂 check out Cris Tovani’s SO WHAT DO THEY REALLY KNOW and Rick Wormeli’s FAIR ISN’T ALWAYS EQUAL along with Barnes’ work for more info. I started reader writer workshop in my sophomore honors classes this year. 4 classes of 30 for 48 minutes. Only one in school doing this. This post helped, but I still can’t get my mind wrapped around how to translate this to grades in my grade book. We need a minimum of nine grades and the class is weighted so it can’t be just formative and all get an A for completion. I feel like I can’t move forward without the grade dilemma solved. I am stuck in my head with deciding what assessments replace quiz grades and how to justify for demanding parents. Kelly or anyone else reading this-can you help me with this??? I feel stuck. Thanks. I love Kelly’s reply about grades, and I need to read more of Barnes’ work! While I do not have a perfect system, and I often feel the pull of the AP English writing rubric by nature of my classes, I’ve let a lot of what I used to believe about traditional grades go. I do a lot more talking to students about our objectives, letting them decide how their work should be scored, conferring throughout the process, and allowing them to self-evaluate at the beginning, middle, and end. This is hard for AP students who’ve been brought up grade grubbing. I’ve found the key is making sure they know the target —here’s what we need to learn and do — and then making sure they evaluate their work based on how close they come to learning and doing it. The hard part is helping some students understand that what they consider hard work does not always equate to quality work and objectives accomplished — or at least improving. I have to coach them, but they do learn how to give themselves honest assessments, and with very little variance, most students are spot on to where I think they’re at with the standards we’ve focused on for that piece of writing. This kind of grading is liberating — for me and my students. I will never go back to me being the judge and stamping on a verdict. Great essay, Amy! I will be sharing this with colleagues this year. Love your final advice – Press forward! This addresses so many concerns felt by teachers wanting to transition to readers writers workshop.